"I’m going to concentrate on Beanworld for the immediate future. The old trade paperbacks are mostly out of print. So one of my most immediate tasks is to get all the previously published material back in print in a viable format for today’s marketplace. Plus, the material that would have made up the fifth collection was never published at all. And there are various other Beanworld odds and ends floating around that are probably worth being collected too." More Beanworld is a good thing, but bringing the previous material back into print, especially the stuff that didn't get collected the first time around (and that I have still yet to find in single issues)? That makes me very happy indeed. Hoo-hoo-ha and a hoka-hoka-hey! Paul Sizer's complete sci-fi series Little White Mouse - one of my most favorite comics of any genre ever - over at Webcomics Nation, updating with a new page every Monday, Wednesday, and Friday. Alex Robinson's mini-comic One Gold Coin, currently being serialized over at his LiveJournal (almost wrapped up now, but that doesn't mean you can't still read it!). Andrew Pepoy's girl & dinosaur buddy comedy/fantasy/adventure/whatever series The Adventures of Simone & Ajax over at ComicMix, updated every Saturday. He's starting by reprinting the original stories first, but will continue on with new material once that's finished. Let's see... colored bits on the head, shoulder, torso, and fists, with everything else just black. There's a recycling joke dying to be made, but I'm just not that snarky today. Feel free to come up with your own. 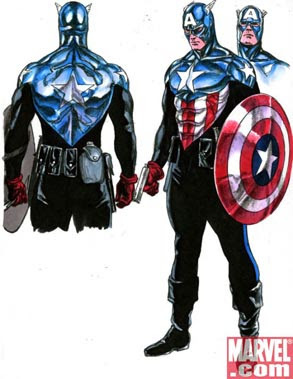 Not that I even dislike that Cap uniform all that much, per se. I just think it's a little too obviously derivative of both his own work and Archie Comics' the Shield. And way too shiny. And the gun's dumb. And I definitely like the old one better. And the black Captain/U.S. Agent costume. And the Ultimate costume. 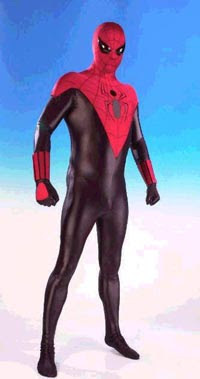 In fact, I think I like the Ultimate costume best of all, which is weird because I hate the Ultimates. Go figure. But for a non-Steve Rogers Captain America, I think it's alright. Not great, but alright. Passable, anyway. The shininess has got to go, though. As someone over on the Comic Geek Speak boards said, the glare makes it looks like a luge outfit.